The 100 Hour Teacher Training Course in Iyengar style Hatha Yoga taught at Om Yoga Rishikesh India is recognised by Yoga Alliance.Intensive yoga course for 100 Hour about body alignment to learn with prope in first week The use of Props -Guru ji B.K.S Iyengar has developed a range of equipment and accessories that enable every person to improve her/his Asana practice and benefits from it .The main purposes Of these "Props are to help the practitioner"
3 day -standing yoga position with spine twist and detail how to do ? 6 -day back bending with rope how to bend body . 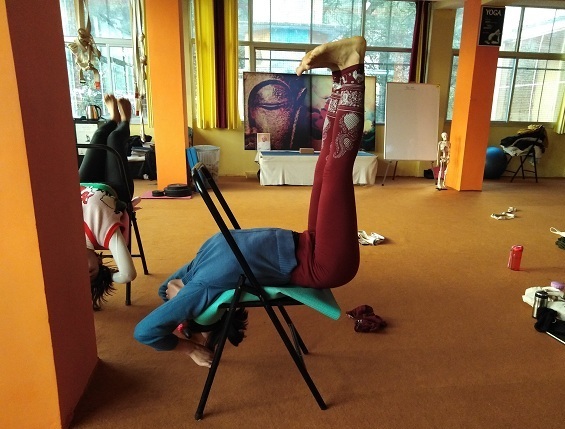 sometime philosophy alternative day and discuses ..
You are yoga teacher if you teach elderly people with moments is difficulties chair can help and learn more and improve .